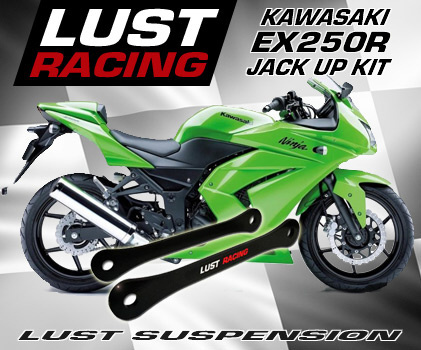 Kawasaki EX250R Ninja jack up kit from Lust Racing. Kawasaki EX250R jack up kit rises the rear suspension and provides quicker steer-in to curves making the bike more agile and more fun to ride. Lust Racing suspension links are made of roll-forged steel, finished in black powder coating with Lust Racing logo. The EX250R jack up kit comes complete with installation instructions. Easy to fit with basic hand tools.